Poring over statistics and expert opinion, R.A. Dyer delves into the endless debate: Who is the greatest player in the history of the game? FEW PLAYERS were more dominating in the short sets. Few were better on the big 5-by-10s. He was the slayer of champions at age 15. He actually won the world championship at age 20, becoming the youngest player ever to do so. He dominated pool for nearly 15 years. For all these reasons and more, many consider Edward Ralph Greenleaf to be the greatest player who ever lived. But there's also William Joseph Mosconi, a man who went undefeated during three world tournaments, and who held the world title on 27 separate occasions. 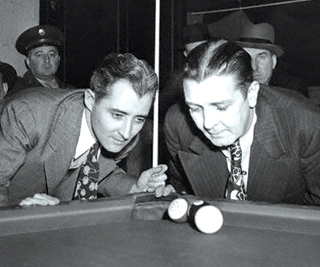 In 1954 Mosconi ran 526 balls successively on a 4-by-8-foot table, the longest officially recorded run in world history. Not surprisingly, many people also consider Willie Mosconi the greatest pool player ever. Welcome back to Untold Stories. In this installment I take up the age-old Mosconi-Greenleaf question. That is, which player really was best? I'll present here the facts, get expert opinions and reproduce the statistics. And then you can decide. Consider this, then, as sort of a voter's guide. I already have an interactive poll posted up on my blog (untoldstoriesbilliardshistory.blogspot.com) where you can vote. I'll get back to everyone later with the results. For this month's column, I've interviewed pool historian Charles Ursitti, reviewed an article he wrote on the subject back in 1983, and consulted his great new Web site, www.charlesursitti.com (see Wingshots, pg. 14). I've also interviewed Greenleaf expert J.D. Dolan, reviewed old newspaper clippings, and cannibalized some of my old research from "The Hustler & The Champ." This column will provide a bit of biographical information about both players, describe some key match-ups, and detail various statistics - many culled from Ursitti's Web site or the BCA's Official Rules and Record Book. Why do I limit the choices to Mosconi and Greenleaf? Know that I didn't start out this way. A few months back I asked readers of my pool history blog whom they believed to be the greatest player in American history. I created an online poll for them to cast their vote, but I also called for write-in selections. As expected Luther Lassiter, Mike Sigel and Steve Mizerak all got plenty of votes - as did the young Shane Van Boening. However, it was Greenleaf and Mosconi who received the most votes. Both had long and dominant careers, both were record-smashers, and both were feared by the competition. When Greenleaf played, many proclaimed him the best ever to wield a cue. The same was said of Mosconi. Nonetheless, neither Greenleaf nor Mosconi came away with a majority of the votes. Mosconi came close, but fell short of the needed margin of 50 percent, plus one. So this column represents a sort of run-off for final two candidates. After you read it, return to the Untold Stories blog and vote. And if you disagree with anything I write here - and people very often do - please feel free to post your comments and let me know. Let democracy flourish!